Recently I found a new cool tool for TabletPCs: Cellwriter. The developer describe it as 'a grid-entry natural handwriting input panel' and it reminds me to the input panel on the Windows XP TabletPC Edition. 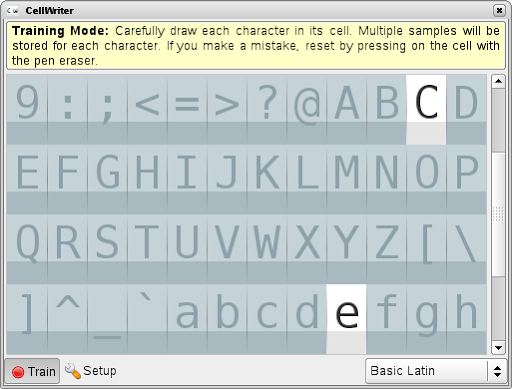 It provides a way to enter text by write characters with a pen to a grid. The big advantage in comparison with e.g. tools like xstroke is: there are no limitation for the way you write a character. You can take off the pen for one character and write points or an other line. This allows to write all characters of Unicode (e.g. German umlauts or chinese). As first you have to train the tool to correctly recognize your input. For this you can use the 'Train'-dialog where you should write each char five times into the related grid. After the user trained CellWriter, he can use it to simple input text, commands or whatever to any desktop application that has the focus. Cellwriter show as applet e.g. in the KDE Panel and can get hide/shown via click on the applet icon. You can place the window free on the desktop or dock it to Top or Bottom of the screen. The input dialog allows also to correct wrong recognized input or to simply delete input. If you finished, simply press enter to send the text to the application with the input focus. If you prefer to enter text via a virtual keyboard, CellWriter has also a solution for this. Simply press on the Keys icon and you get a virtual keyboard. Unfortunately this works for me only if the window is docked to the screen, but I assume it is a bug. There is also some more room for improvement: I could not find a way to configure the layout of the virtual keyboard, it was always US. The user need to train the tool before use the first time. It would be useful to have a basic pre-trained mode, which would allow the user to simply use it from the first start (at least for basic Latin characters). The keyboard need to get fixed (see above) and should support configurable key maps. If CellWriter is docked it should simply roll itself up if the focus get lost (like yakuake). If Cellwriter is in not docked the window is unfortunately always on top, thats annoying. It would be cool if Cellwriter would detect input areas automatically and would show a icon besides this area to pop-up the input window. Not sure if this is that simple or if this need some changes in the desktop environments, but it should be IMO possible. Conclusion: Cellwriter is a great tool, I like it. It allows TabletPC users to get basic, but natural handwrite recognition. Simply forget xstroke, this tool is very much powerful. I have already packaged it for openSUSE 10.2, 10.3 and Factory. You can get the packages from my repository. Feel free to install and use it. We plan to add the package to the next openSUSE release. Since SLE10/SUSE 10.1 SaX2 supports to configure the touchscreen of the Fujitsu Siemens P-Series Tablet PCs. Unfortunately the needed driver for the X server wasn't free available at this time IIRC. Some weeks ago I added a repackaged version (merged libtouch code from the evtouch driver and added the code to a working autotool package) of the fujitouch driver (v0.6.3) for openSUSE 10.2/10.3 to my home project at the openSUSE build service which work with Xorg 7.2. Unfortunately I had no access to a p-series machine, but I got contact to a user with a P1610 which helped with testing to get the package basically working (only rotation via tools like KRandRTray didn't work). Now there is a new version 0.6.4 which support automatically rotation via the XRandR extension and which use the same package structure as my version of 0.6.3. You can find RPMs (including some patches to build correct) for SUSE here, feel free to install and report problems via the Novell Bugzilla. The package get merged into the SUSE distributions as soon as the driver work as expected. I packaged a special 'SaX2 Tablet PC Edition' (available for SLE10/10.2/10.3) which fix the existing Tablet PC support and provides now more support in for Tablet PCs in the Tablet section than the normal sax version (IBM X41, ACER TM C300/C301/C302 series, Fujitsu Lifebook T series (T3010/T4010), HP Compaq TC4200, Motion M1200 and M1400 and general Wacom Tablet PCs). Feel free to download and install, but also to report your special settings for other machines to me. Added a updated version of the wacom input driver (for SLE10/10.2/10.3), Jarnal and Xournal to my home project. For factory/10.3 this should happen automatically via HAL (a updated HAL version for 10.2 will follow the next days). To configure your X-Server you should download and install my 'SaX2 Tablet PC Edition' where you can simply select the Finepoint device in the Tablet section. Now are also updated packages (v0.7.2) of KPowersave for Debian via experimental available (see here). Thanks to Michael Biebl for packaging and maintain the package for Debian. 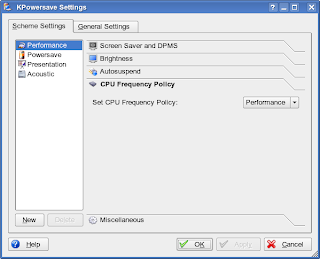 Also thanks to Luka Renko for update the Ubuntu/Kubuntu KPowersave package to v0.7.2. As it looks also many people would like to see KPowersave as default (see e.g. this discussion) on Kubuntu. Maybe Kubuntu can switch from the guidance-power-manager to KPowersave (since we use now HAL instead of powersave) as default under KDE ?! Feel free to test the packages and report bugs to your distribution.